On the brink of a new year, I’m looking back on 2018 with satisfaction and maybe a smidge of exhaustion. 2019 looks to be just as full of writing challenges and delights! 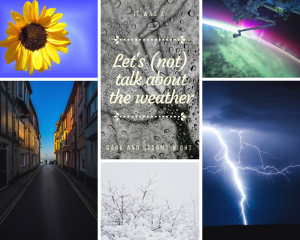 In case you missed anything, I’ve summarised my writing year below – and teased with some of my upcoming projects for 2019! Thank you all for your support during the year – 2018 was fraught in many ways, but I hope it brought rewards as well. May 2019 bring you more of what you love, and more of what heals you. Writing 100 stories in that format, and with a contemporary setting, was a challenge which I enjoyed immensely. I may even take it up again later next year! Although not yet published, Kitty and Cadaver made an official debut with a song! “The Rain Song” appears about half way through the book. The band Bronze has released it on their EP The Razorback Five Track. 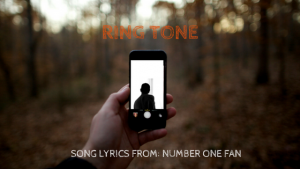 Here is “Rain Song” – a song about precipitation which is also a spell to make it rain! 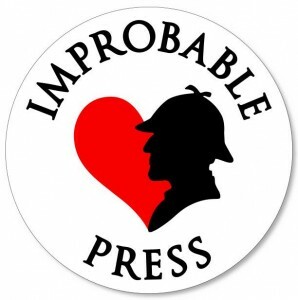 I sold a few Holmes and Watson stories during the year: in one, I recast them as contemporary Australian hipsters in “The Problem of the Three Journals“, solving crime and serving excellent coffee, for the Baker Street Irregulars: The Game Is Afoot anthology. 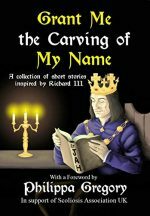 I admit the most fun I had with short fiction this year was my contribution to Grant Me the Carving of My Name, a collection of stories about Richard III edited by Alex Marchant and designed to raise funds for the Scoliosis Association UK. One of my very few science fiction tales was published this year too – “Earworm Armageddon“, told from the PoV of a deaf protagonist, was picked up by Jay Henge publishing for Wavelengths. My most massive achievement this year – in term of words and time – was setting up my Patreon, through which I’ve re-edited and re-published my two M/M crime novellas, Fly By Night and Sacrifice. My patrons received the book in November, and the official release (a co-production with Clan Destine Press) is scheduled for around February 2019, after a few delays pushed it back. So before the year even begins, I have writing news for 2019. 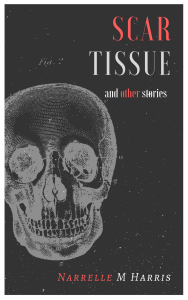 There’s Scar Tissue and Other Stories for February – which, among other things, contains short stories set in the Ravenfall, The Adventure of the Colonial Boy, The Vampires of Melbourne series and Kitty and Cadaver universes! Then in March, the third Duo Ex Machina novella, Number One Fan, will finish its chapter-by-chapter run and be prepared for an ebook release. Pipping that one at the post will be Grounded, a spec fic romance about two people who can’t fly in a world with wings. Escape Publishing has done a beautiful job of the cover and I’m excited to see this book released on 20 March! Of course, this only brings us to March. I’m sitting on an announcement for a short story that’s been accepted – when the anthology is officially announced I’ll send out the news first in my new newsletter, Mortal Whispers. The first novel I’m working on for the year (now that Grounded is all edited and ready to go) is Kitty and Cadaver. I’m hoping for that to come out mid year in time for some SF conventions in June. I plan to tackle the third in the Vampires of Melbourne series, which will coincide with a re-release of the first two books as ebooks with new covers. I’ll also be working on the fourth Duo Ex Machina novella, Kiss and Cry from April onwards. Folks. It’s gonna be another big year! Upcoming rewards for my Patreon supporters! My first six months on Patreon have gone really well, and I’d like to thank everyone who has supported me there to write fiction! 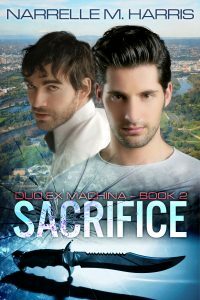 The second of the Duo Ex Machina novellas, Sacrifice, will wind up its chapter-by-chapter posting soon, and will then be prepped to go to all my supporters there as an ebook! I’ve also reached my first income goal, which means a new short story collection will be produced in the next few months. All my supporters will get a copy of Scar Tissue and Other Stories as a reward before the book goes on sale elsewhere. 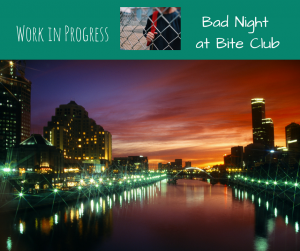 My Patreon supporters help me write fiction directly by paying a small amount each month. The income helps me to pay for things like covers, editing and proofreading. In time, I hope I’ll have enough income from all the mini-Medicis who support me to work a little less on the corporate writing side so I can write a little more on the fiction side! What do you get for supporting me on Patreon? chapters in my Duo Ex Machina series of M/M crime/romance novellas as they’re posted. Everyone who supports me gets a copy of my first Duo Ex Machina novella, Fly By Night and, when it’s finished the fortnightly posting, the second, Sacrifice, will also be available to all my Patreon supporters. I have three more novellas in the series planned, and those will also be posted chapter-by-chapter as well as being provided as ebooks as they’re completed. I’m currently completing some stories for a short story collection, Scar Tissue and Other Stories, which contains previously published fiction as well as new stuff. These stories includes flash fiction, Holmes♥Watson stories, stories set in the universes of my novels, including The Adventure of the Colonial Boy (canon-era Holmes♥Watson), The Opposite of Life (vampires in Melbourne), Ravenfall (M/M paranormal thriller) and the yet-to-be-published Kitty and Cadaver (urban fantasy with music). For the $1 level, you’ll get free books, posts about my research and lyrics, and early cover reveals. For $3, you’ll also get sneak peaks, fortnightly chapters of new books, art and music posts. At $5 you also get bi-monthly writing tutorials. At $15 I’ll also send you greeting cards three times a year! Top level supporters can get autographed paperbacks and I’ll write you a personalised short story! If you’d like to support me, at whatever level, you’ll be helping me write more fiction, so that’s win/win, right? 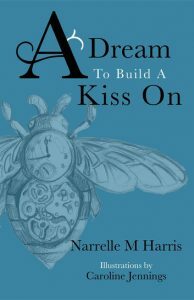 Support Narrelle M Harris on Patreon.